As you age, you’re more likely to start losing teeth here and there. Once the first one goes, you might feel like you can put it off for a few more years. Then another one falls and you start to wonder. 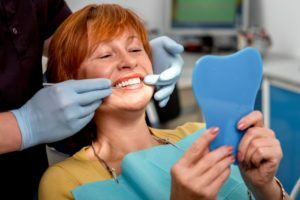 “Should I start considering tooth replacement options?” You’d be right to, as missing teeth do a lot more than change your smile or your diet. According to your dentist in Fort Lauderdale, missing teeth can cause many problems you never realized. That’s why he’s made a quick list of consequences that gaps in your smile will lead too. When your mouth is missing teeth for long periods of time, you might notice more difficulty chewing and moving your jaw around. This is because your jawbone and muscles in your mouth are no longer being stimulated by your tooth roots. When you have teeth, blood flows into the roots and accesses the other parts of your mouth. Once teeth fall out, blood is no longer being flowed to those areas, causing your bone to shrink and your muscles to weaken. However, these changes are not exclusive to muscles and bone. Your tooth recognizes empty spaces in your mouth. When you have gaps in your smile, the remaining teeth will begin to move into those gaps in order to compensate. Eventually, your teeth will become severely crooked and start growing in awkward directions. With crooked teeth comes other complications you might not have expected. As your teeth become crooked, your smile won’t be the only thing that changes. Your bite will also start to shift dramatically. As crooked teeth are more difficult to clean, a bad bite makes eating food more cumbersome than it should be. Ideally, the better your bite is, the more effectively you’ll be able to chew food and produce saliva. Saliva production is incredibly important because the more saliva you produce, the more digestive enzymes get released in your mouth. These enzymes contribute to removing plaque buildup and reducing cavities. That means the remaining teeth you do have will be in worse condition in the long-term. As mentioned before, bone and muscle deteriorate when there’s no teeth to support them. However, that doesn’t just affect the inside of your mouth or basic functions. It also causes your skin to sag more quickly. If you want to maintain the elasticity of your cheeks and gums, blood needs to flow to your mouth. Don’t put off replacing teeth. Schedule an appointment with your dentist in For Lauderdale to learn about the best tooth replacement options available! Dr. Marc Mingel earned his bachelor’s degree in Biology from Columbia University. He then attended Tufts University School of Dental Medicine in Boston to earn his dental degree. His practice is more than capable of performing many dental treatments, including complex dental implants. To learn more about his practice, contact him at (954) 566-1548 or visit his website.